Ian Gough made his Wales debut in the infamous 96-11 defeat to South Africa in Pretoria in 1999. Despite this demoralising debut, Gough secured a berth in the Wales squad on a regular basis until 2002. A dip in form and the emergence of Brent Cockbain and Robert Sidoli led to Gough's exclusion from the squad until his comeback during the 2005 Grand Slam campaign, where he featured as a replacement against Italy. Domestically, Gough had become part of the regionalised Newport Gwent Dragons in 2003. He had previously represented Pontypridd and Newport at club level. Gough made his presence felt during the 2006 Six Nations, when an injury to Cockbain opened up a slot in the Welsh second row. A selection of muscular displays amongst a depleted Welsh side made him an important part of the setup, and he was retained by new coach Gareth Jenkins for the 2006 autumn series. Regularly starting alongside the young Ospreys pair of Ian Evans and Alun Wyn Jones, Gough became the senior figure in the engine room of the Welsh side. Another disappointing Six Nations for Wales followed in 2007, but Gough was selected for the 2007 World Cup in France as one of four options at lock. An increased physicality at the breakdown began to set Gough apart from his peers during the tournament, and he began to assert himself as a genuine physical presence despite the lacklustre Welsh effort that saw them exit the tournament at the hands of Fiji. Gough made the switch to the big spending Ospreys at the start of the 2007-8 season, cementing his position as one of the most valuable players in Wales. Gough has flourished under new Welsh coaches Warren Gatland and Shaun Edwards, upping his physicality on the deck again and becoming a dominant presence in the newly functioning Welsh lineout. Gough played a big role in the 2008 Welsh Grand Slam, being particularly impressive in defence during the Triple Crown victory against Ireland at Croke Park. He led the Wales team out for the deciding game against France at the Millennium Stadium, winning his 50th cap as Wales secured a famous victory. 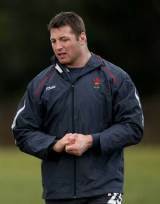 In 2009 Gough continued to hold down a place in the Six Nations squad and also toured North America with Wales. In November he was left out of the squad for their Tests against New Zealand, Samoa, Argentina and Australia but immediately recalled ahead of the 2010 Six Nations.